UnC0ver iOS 11 - 11.4 Jailbreak Is "out of beta"
A couple of days ago we reported to you that iOS hacker Pwn20wnd announced iOS 11 - 11.4 jailbreak released using UnC0ver. Today he is here again and he has just announced that the tool is officially out of the beta-esque RC stages. Pwn20wned officially launched what’s being dubbed unc0ver V1, and it apparently ties up many of the tool’s known loose ends. Anyone having problems with an earlier version of unc0ver is advised to use the RootFS Restore feature in the jailbreak app and then re-jailbreak with V1 of the tool. As Pwn20wnd explains, this should resolve most, if not all issues reported with the jailbreak. 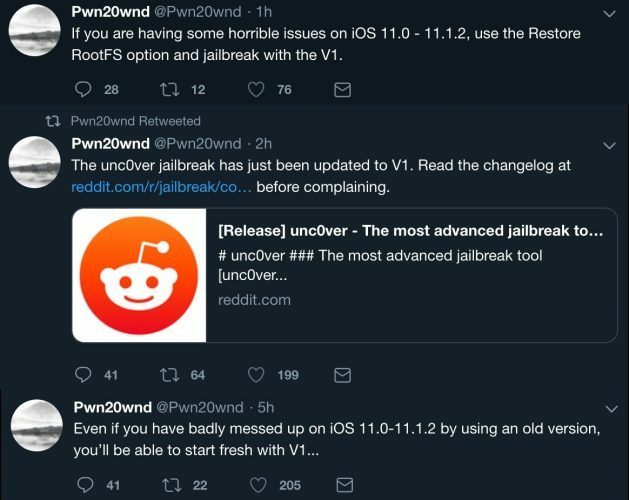 If you’re currently using an older version of the unc0ver jailbreak on your handset, then you’re advised to download V1 from Pwn20wnd’s official Github repository at your earliest convenience to utilize its latest improvements.